Dory and friends returned to the big screen on June 17 to a resounding welcome from kids and adults alike - and it's no wonder why. The story provides opportunities for viewers to draw motivational lessons from Dory that they can apply to their own lives. Runners find motivation in lots of places and runDisney runners can find motivation in all things Disney. 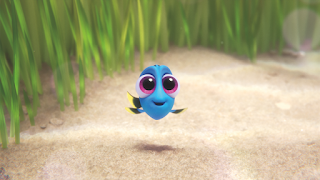 So let's take a look at what runners can learn from Finding Dory to inspire your training. The movie begins with Dory having a memory from her childhood, a rare occurrence for a fish suffering from short term memory loss. The memory of her parents encourages Dory to begin an adventure across the ocean to find her parents. No matter how insurmountable the odds may seem, Dory never gives up. I love the shirts that say "just keep running." As someone who runs for fun, certainly not for speed, I use the "just keep running" motto to push me through long runs to train for half-marathons. Dory doesn't always get places fast, but she has fun getting there. . .kind of like me! Throughout the trials and tribulations of life, we rely on the support of family and friends. That support can help motivate us to push ourselves beyond what we believe our potential may be. In the movie, Dory relies on both old and new friends as well as family that she is just starting to remember in order to find her way home. In my own life, the support of my family and friends has meant the world to me in all of my endeavors, especially running. Whether it's giving me the time to run by keeping the kids or standing at a finish line cheering me on, I couldn't be a runner without family and friends supporting me. As a society we are always looking for instant gratification. Dory didn't get that. In fact, without spoiling to much about the movie for those who haven't seen it yet, the little things she begins to remember about her parents ultimately teaches her how to find her way back to them. As runners, the same is often true for us too. Training for a race isn't something that happens overnight. In fact, it's not even something that starts in the weeks or months ahead of a race. Each training run and each race that we've had over the years has taught us something we can learn to improve ourselves and has made our mark on our running biography. There are so many powerful messages that you can discover in Finding Dory. Whether or not you're a runner, these life lessons can inspire everyone to achieve your fullest potential. If you enjoy Finding Dory and want to learn more fun ways to celebrate the release - check out some other amazing bloggers with lots to offer from Disneybounding, to crafts, to food! Visit the linkup here!